PRINT THIS ON LEGAL SIZE PAPER! Print the pages below on LEGAL paper. 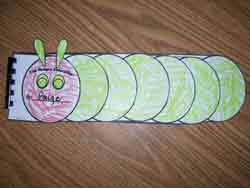 Have the children color the circles to make a caterpillar. 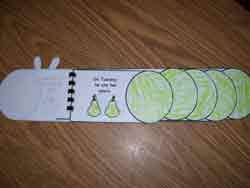 Have them color the fruit and illustrate the last page. Color, cut and glue the antennae onto the head. Cut the pieces out. Put the pages in order and bind. Practice reading!